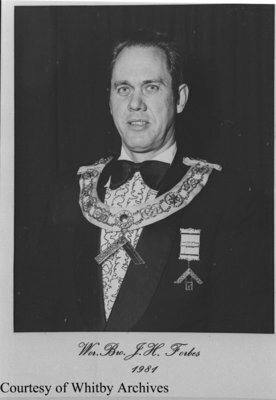 A black and white negative of John Forbes dressed in his lodge attire. John Forbes was Worshipful Master of Composite Lodge in 1981. John was born at Kaladar, Ontario, on 13 April 1925, and came to Whitby in 1963. He was an electrician at the Whitby Psychiatric Hospital from 1969 to 1990 and also worked for Curt Brown Electric and Gower Electric. He died at Whitby on 10 March 1991 and is buried at Flinton Cemetery. John Howard Ira Forbes, 1981, Photographer Unknown. Whitby Archives A2016_017_003A.